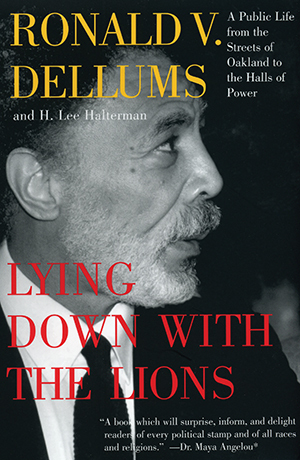 Tells the stories of Dellums’s remarkable life and of his political battles, with lessons learned about leadership, politics, and the importance of building coalitions to effect change. Profound and humane, Lying Down with the Lions ensures Ronald Dellums’s place as one of our most important leaders of the second half of the twentieth century. When Dellums arrived in Washington in 1971 to represent Oakland, California, in the House of Representatives, his radical activism had already earned him a place on Nixon’s enemy list. When he retired in 1998—his radicalism still intact—he left a record of accomplishment that has made an indelible mark on our political landscape. He fought for sensible defense policy, health care reform, and ending apartheid in South Africa, to name just a few of his courageous struggles. From his days as a freshman from California’s 9th Congressional District, to helping to found the Congressional Black Caucus, to being the first African-American to serve on and later chair the House Armed Services Committee, Dellums’s tenure in the House is both a testament to his significant career and a crucible of American politics. Guide written by Nirmal Trivedi. This autobiography by Congressman Ronald V. Dellums addresses the central challenge that faces today's activists and politicians, namely that of finding a balance between ideals and politics. Dellums takes us to the heart of progressive politics in Washington while maintaining a thoughtful and introspective tone about personal growth in light of a lifelong commitment to public service. As a man committed to the ideals of social equality, Dellums describes his efforts to promote peace in terms of his time in Congress, and the risks he took in holding steadfastly to his convictions. As an African-American driven to end racist practices domestically and abroad, Dellums recounts how he had "learned a long time ago from my parents, particularly my mother, that you define who you are, you don't let the other guy define who you are." This philosophy, coupled with the words of Martin Luther King, Jr. that "peace is more than the absence of war, it's the presence of justice" sets the stage for what Dellums considers his greatest moment in office: escorting President Mandela to the stage of the House, marking the end to apartheid in South Africa. The autobiography is an extension of Dellums' politics through writing: "Maybe I'm wrong, but I believe the world is constantly moving forward, that the march of life is a progressive march. I call myself a progressive because it means moving forward, constantly rethinking, and constantly reassessing. And with a very tightly drawn ideological perspective, you get caught up in time warps, you get caught up in a narrow focus. From my perspective there are values that transcend time." Dellums' philosophical outlook of positive social change through open communication was tested when in 1977 Dellums and his family opened their home to an African exchange student. Expecting to meet a person of color, they were surprised when a white South African girl stepped off the plane, but no more so than the girl, a product of the apartheid system who viewed black people as second-class citizens. This true story, dramatized in the Disney film "The Color of Friendship" is a testament to the challenges Dellums' faced in his own life with race and politics, as well as a fresh perspective to the problem of racism and the will to fight it. Ronald V. Dellums represented California's Ninth Congressional District for twenty-seven years. He is now president of Healthcare International Management Company. He lives in Washington, D.C., and will teach at Brandeis University's Heller School in Waltham, Massachusetts, during the spring 2000 semester. H. Lee Halterman was a member of Dellums's staff and his principal spokesman, as well as the director of policy for the House Armed Services Committee during Dellums' s chairmanship. He lives in San Francisco. What are your feelings about the potential of political action to effect social change? How did this book effect those views? Describe the relationship of Dellums to his Uncle C.L. Dellums. What comments does this relationship make on the idea of role models? Think about the ways in which Dellums depicts himself as an adolescent (i.e. character strengths/flaws, racial consciousness, etc.). How does Dellums want the reader to think about him as a child and later as an adult? How did Dellums enter politics, and what sacrifices did he make? Do you see him as admirable for these actions? How did the political and social environment of the 1960s effect the ideology of Dellums as a young politician? Did these initial ideals evolve as Dellums became entrenched in more socio-political struggles? In the chapters "Sit Down Man-- We're Going to Win This One" and "Revolution Inside the System," Dellums defines a political strategy that he would use throughout his career. How does this strategy of coalition-building work and in what ways is it "alternative politics"? Think about how Dellums describes the creation of the Congressional Black Caucus (CBC) and his own appointment to the House Armed Services Committee (HASC). In what ways does Dellums (re)define the meaning of patriotism and citizenship. In what ways do you understand being American or being a citizen of a nation? Think about the following quote: "like many of those who argue today that they have achieved everything on their own, I failed to recognize then that sometimes it takes collective action to obtain the enforcement of our rights which in turn allows each individual to achieve to their best ability." (p. 19) Dellums appears to favor collective action, but in what ways has Dellums been highly individualistic? What balance do you think is appropriate for a politician? Perhaps a large part of Dellums' success in office has been a result of his ability to change his way of looking at politics (i.e. preferring coalition building to the outdated partisan politics). Have local politicians changed the way in which you see politics, or do they seem to repeat the same rhetoric? What do you know about apartheid in South Africa and what did you learn after reading about the struggle to end it. Did you or your community take a position on apartheid? Might you have? Are there any anti-racism initiatives in your community? Think about Dellums' energy towards promoting peace in favor of arms proliferation. Is this an issue you see as a contemporary concern? In one of the final thoughts of the autobiography, Dellums comments that "the current generation of young people has grown up in a cynical era in some measure culturally dominated by the proponents of reaction. They are removed from our victories, of the time during which we moved history forward. It is my hope that this book has provided both a measure of inspiration and the evidence that principle married to determination can lead to success." (p. 201) Do you consider this book successful in this respect? Why, or why not? What actions do you believe are appropriate interventions, on a local and national level, for you and your community to take towards the goal of a more equitable society? RD: "Peace is more than simply the absence of war; it's the presence of justice"--a magnificent statement made by Martin Luther King. I don't think he intended that as an ideological statement; he intended it as a statement of principle. RD: Yes. And I thought it was an incredible statement because it helped me understand my role in a new way. I said, "What this man is saying is that there's only one movement, and that movement is the movement for peace. What would America be like today--it is interesting to ponder--if the anti-Vietnam War movement had really been a peace movement in Martin Luther King's terms? What if, rather than, with the end of the war, going home to celebrate victory, the movement had stayed on the forefront and said, "This is simply ending a war, but this is not peace. Peace is justice. Let's get on with the civil rights movement. Let's get on with the liberation of women. Let's get on with the liberation of gays. Let's get on with the preservation of the environment. Let's get on with full employment and the livable wage, let's get on with child care." Suppose that big movement had stayed out there and said, "Ending the Vietnam War was step one. Now we're going to get on with the unfinished business of providing justice to people who desperately need it."